Tomorrow: Windy & milder. Sun & clouds. Near 50. Sunday: Early showers, then clearing. Low 50s. Another unseasonably mild January weekend is on the way to New England. A gusty southwest wind will push high temperatures on Saturday into the 50s for many across Southern New England. Even farther north in ski country temperatures will spike into the 40s. A cold front then drops in from north to south on Saturday night, first bringing a few extra clouds and a few spot showers to Northern New England. 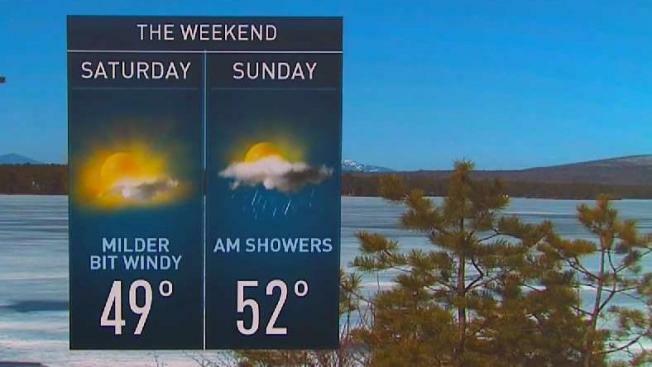 The front arrives in Southern New England on Sunday, meaning much of Massachusetts, Connecticut, and Rhode Island will begin with clouds and a few showers. Temperatures will still be near 50 in these areas though. In Northern New England temperatures will be in the 30s and 40s, a bit cooler since the front will already have moved through those areas. Even in Southern New England temperatures will fall a bit during the afternoon as cool air returns, but partial sunshine will also redevelop. That same front then stalls offshore early next week, becoming the focus of a ballooning coastal storm. While the exact track of the storm remains a bit uncertain, it’s likely to pass close enough to bring at least some snow to New England. The odds of accumulation would be highest south and east of Boston. If the storm continues to track west we can expect more impacts, and more snow, from this storm. A track farther east would result in fewer impacts.